It was mostly male resistance to the idea of sending women into space that doomed the chances for Cobb and others to make it to the moon in the 1960s. 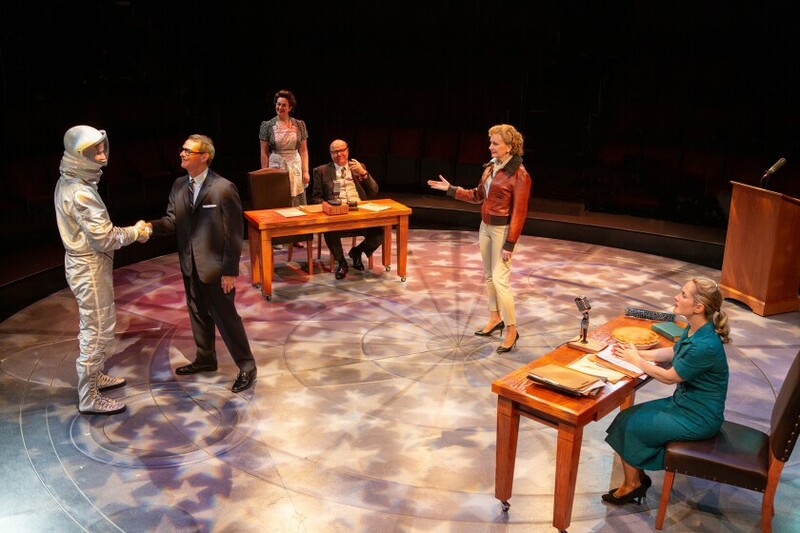 But while those pioneers never got to break the bonds of Earth, Ollstein’s fact-based “They Promised Her the Moon” finds all kinds of dramatic lift in its West Coast premiere at the Old Globe. The play is all the more impressive for unearthing the story of an accomplished aviator whose story is almost unknown today. Cobb (played by Morgan Hallett with wit and heart and a steely sense of resolve) was one of the world’s top female pilots — probably one of the top pilots, period — when she was recruited for a training program known informally as the Mercury 13, a play on the earlier Mercury 7 initiative that minted the first (all-male) astronauts. The program was run by the physician and NASA official Randy Lovelace (Matthew Boston, lending a good sense of gravitas), and financed by the wealthy husband of the legendary aviator Jackie Cochran — a key figure in the play, and an unforgettable one thanks to Mary Beth Fisher’s brash, funny and pretty much irresistible portrayal. Lovelace’s idea was to see how women fared in the same tests the men had undergone earlier. Many did well, but none so spectacularly as Cobb, who spent an astonishing 10 hours floating in an isolation tank — far longer than any other subject, male or female. Ollstein and director Giovanna Sardelli, a Globe returnee (“The Whipping Man,” “Somewhere”), ingeniously use Cobb’s time in the tank, and its suggestion of hallucinatory visions and out-of-body experiences, as a way to interlace memories of how she got there. We’re introduced to such key figures as Cobb’s warmly supportive if boozy dad (an appealing Michael Pemberton), her deeply religious and strict mom (Lanna Joffrey, wonderfully flinty and pitch-perfect) and her boss-turned-beau Jack Ford (a disarmingly charming Peter Rini). All three of those actors plus the versatile Boston play multiple characters. Timelines are necessarily compressed in this two-hour, one-intermission show that ultimately spans about 40 years of history, so it’s no surprise that events sometimes unfold with a slightly unnatural briskness. But one wonder of Ollstein’s writing is the way she’s able to pack a whole lot of exposition — on the space program, Cobb’s past aviation exploits and more — so economically into the piece, in a way that rarely feels forced. She would make a NASA payload specialist proud. Sardelli’s smartly resourceful production also pulses with a sense of the theatrical: Cobb “flies” on a platform that moves around Jo Winiarski’s spare set, and Jane Shaw’s sound and Cat Tate Starmer’s lighting infuse scenes of storms (and barnstorming) with drama, helped by Hallett’s highly physical portrayal. Denitsa Bliznakova’s costumes also track the shifting eras stylishly (with particularly great looks for Fisher). With the second-act farce of a congressional hearing — drawn from real transcripts, and featuring future astronaut (and senator) John Glenn as an amusingly self-involved naysayer — it’s clear Cobb’s dreams are destined to be dashed. But as touched upon in the play’s coda, she would go on to a distinguished 40-year career flying humanitarian missions in South America. Cobb left her heart on the moon, but her legacy will belong to the stars. 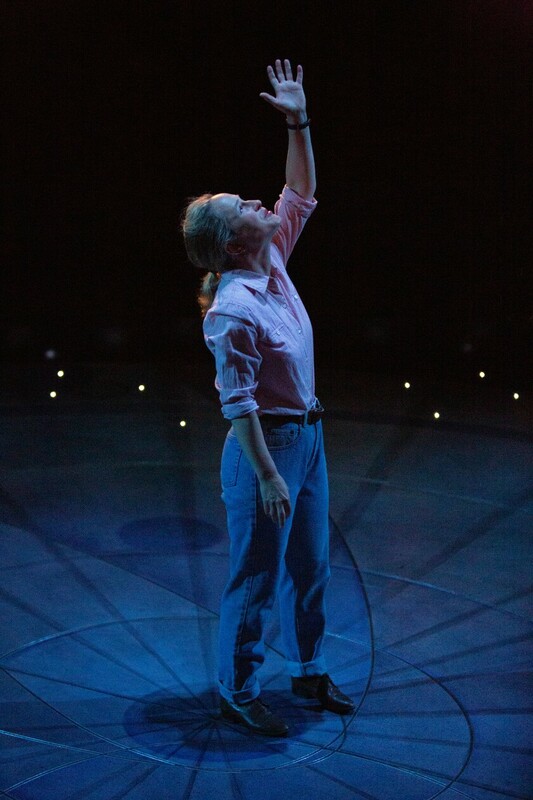 Morgan Hallett as Jerrie Cobb in “They Promised Her the Moon” at the Old Globe. When: 7 p.m. Tuesdays-Wednesdays; 8 p.m. Thursdays-Fridays; 2 and 8 p.m. Saturdays; 2 and 7 p.m. Sundays. (Check with theater for exceptions.) Through May 5. Previous articleProfessional Sports Gambler James Holzhauer’s Aggressive Style Paying Off on Jeopardy! Next articlePaid Family Leave: What’s the Right Model?